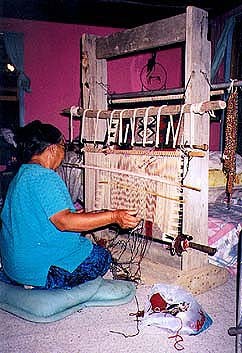 Elsie Shay weaving in her home. Her family's homesite was bisected in 1974 by the Congressional law that created the NPL (Navajo Partition Land) and HPL (Hopi Partition Land) (their traditional winter and summer grazing areas were divided by a fence). Her husband, who is in his 70s, was served with an "exclusion order" in June 2001, to bar him from the HPL side of his ancestral homesite. Mae Washington is a social worker and educational counselor whose family comes from Coal Mine Mesa and Big Mountain. She knows firsthand the traumas of forced relocation, and she works with many Dine' individuals and extended families who have suffered from this ongoing tragedy. Mae helped organize our first hay run, recruiting some of her relatives to help with unloading the heavy bales of hay, translating, explaining, and seeing that things kept moving. 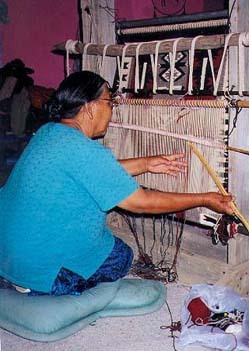 These weavings are consigned by her for Black Mesa Weavers for Life and Land. MBM-159. 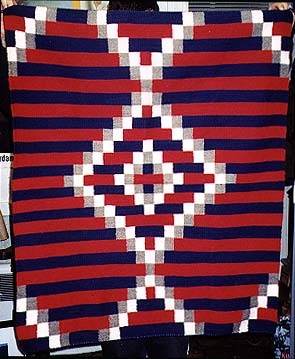 Chief's blanket design, child's size, consigned by Mae Washington, all native processed wool, 40 in. x 33.5 in., tan/grey, red, dark blue, white. SOLD at Cultural Survival summer bazaar, Tiverton Four Corners, RI. MBM-126. 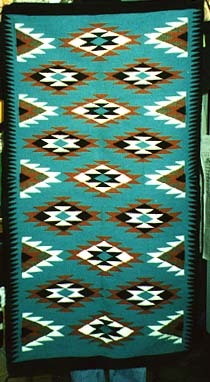 Woven by Lavina Benally, all native processed wool, bright and cheerful soft blanket in turquoise, rust, white, carded brown/grey, and black, 47.25 in. x 25 in., SOLD. MBM-87. Consigned by Mae Washington. All native processed wool, handspun natural white warp fringed throw, 19 in. x 12 in., carded tan, deep red, natural white, black. SOLD. #MBM-38. 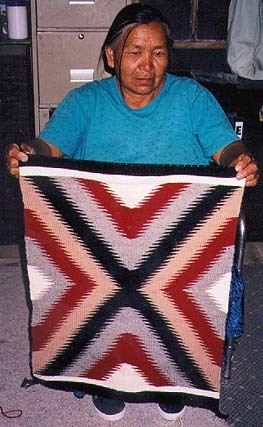 Elsie Shay holding her vivid, diagonal blanket motif weaving, 27.5 in. 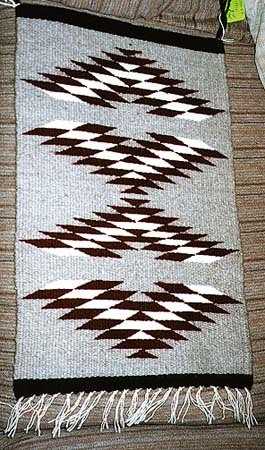 x 21.25 in., medium weave. SOLD. One of Glenna Begay's granddaughters, swinging on a rope at her grandmother's home on Black Mesa. 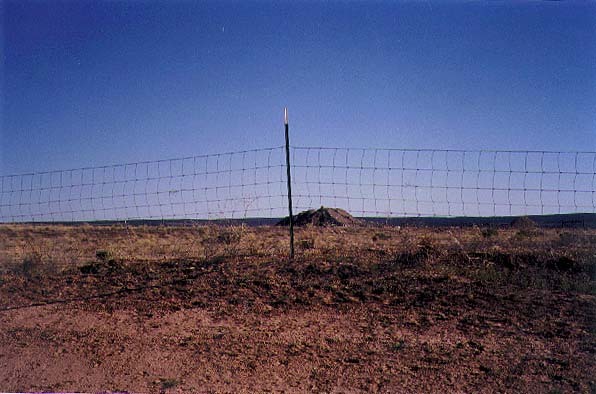 The fence that severs the land near Glenna Begay's home. I returned June 20, 1999, from three weeks on Black Mesa and visiting Dine' friends on the eastern part of Dine'tah, in New Mexico. I was honored to meet and visit with some of the people of Black Mesa, to touch the land and share a few moments of their lives. I also met with the Hopi BIA at Keams Canyon, with Navajo Nation executives at Window Rock, and spoke to people at Tsegi Canyon, at Betatakin, at Spider Woman Rock in Tse'yi' (Canyon de Chelly), at Teesto, Pinon, Chinle, Hubbell Trading Post in Ganado, and Homolovi, Flagstaff, and Albuquerque. Everywhere I went, Black Mesa was known to the Dine', and most people spoke of it in ways that evoked the sadness of their telling about the Long Walk. As I drove north from Phoenix on June 1 and 2, it rained heavily in Cottonwood and Flagstaff; when I left via the Thoreau/Crownpoint area the last two days (June 17-19) it rained heavily again. I hoped that it rained on Black Mesa. 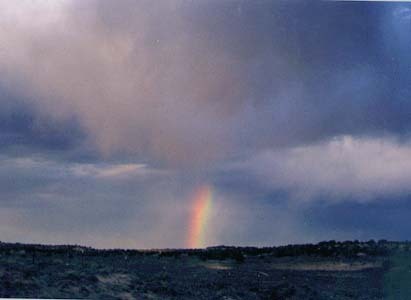 This poem was written as first a rainbow appeared and then the rain began as I was traveling away from Black Mesa, near Ganado. Does it rain on the hardened heart? her birds, her pinyon and juniper? Does the rain know her still? Where the water was, there is sand. is slurried from her veins. and the children's are her stones. but who knows Black Mesa? Who will tell her song? 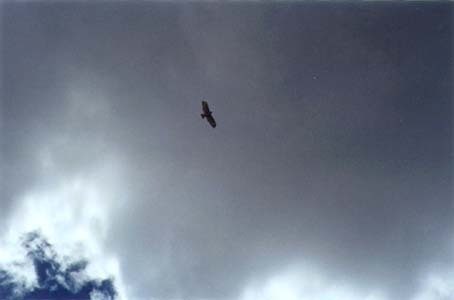 All photographs and poems © 1999 Carol Snyder Halberstadt. Copyright © 1998 -2001 Carol Snyder Halberstadt, Migrations. All rights reserved.